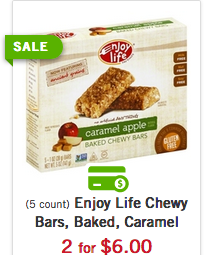 FREE + Profit Enjoy Life Bars At Price Chopper! Deal: buy 3 ($12 you must spend is based on shelf price), use (2) $2/1 & (1) $1.50/1 plus saving star = 3 FREE + $3.50 profit! Or use (3) $3/1 plus saving star = 3 FREE + $7 profit! FYI...these are 2/7.00 at my store, no apple. However I used 4-3.00 off coupons so paid.50 cents a box and a 3.00 OYNO coupon printed when I checked out. SO still free plus 1.00 profit.